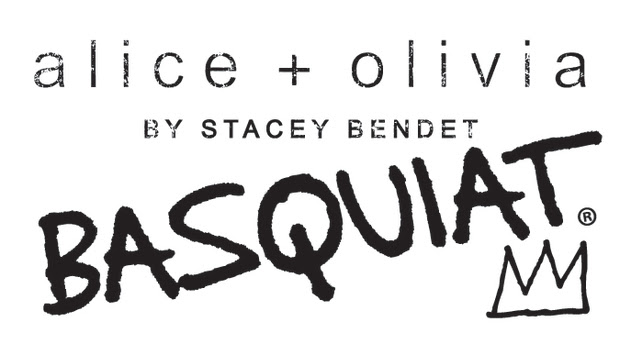 alice + olivia by Stacey Bendet is proud to announce that the late Neo-expressionist artist and frequent Andy Warhol collaborator Jean-Michel Basquiat has been selected, through the Basquiat Estate, as the partner for the second capsule collection that will help support the Council of Fashion Designers of America’s efforts to promote young talent. The collection, shown as part of the alice + olivia Resort 2017 season, will land in stores and online in November 2016. Jean-Michel Basquiat earned his recognition in the art world before the age of 27, even gaining the title of youngest artist to be given a solo show at the widely respected KestnerGesellschaft gallery in Germany. His personal achievements and participation in an American art movement that ushered in a wave of young new artists make Basquiat the perfect next partner for the promotion of young artists within the fashion industry. 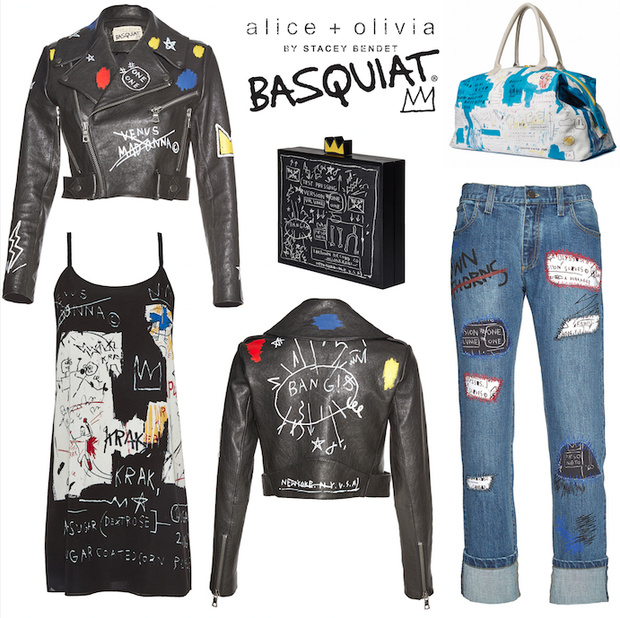 The new collection includes a variety of unique apparel pieces, accessories and gifts that feature iconic elements of Basquiat’s art, such as the golden crown and colorful, street-art inspired design, mixed with alice + olivia’s whimsical and feminine touch. “Beat Bop” 1983, “Replicas” 1983, “Ascent” 1983, “In Italian” 1983, “Panel of Experts” 1982 and “Notary” 1983 are some of the artist’s famed works that Bendet cites as inspiration for the capsule collection. Elements of these iconic works can be seen throughout the collection of apparel, accessories, and gifts. 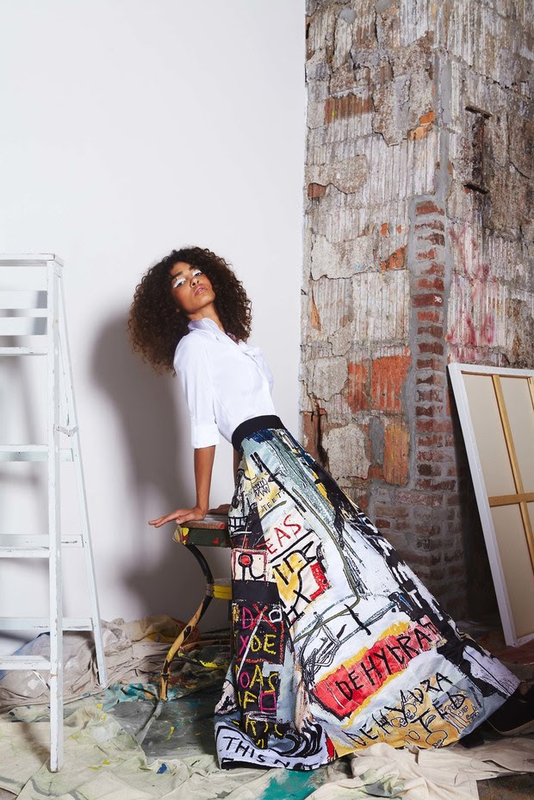 Bendet delivers a modern interpretation of Basquiat’s iconic artworks with the incorporation of beadwork and embroidery details which add a dimensional element to the iconic Basquiat works as they come to life in the form of dresses, tops, skirts, jackets, handbags, shoes, eyewear and more. For the first CFDA capsule collection, debuted in April 2015, Bendet partnered with celebrated artist Domingo Zapata, a Spanish-American who has studios in New York, Miami, and Hollywood. Zapata’s pieces created for the partnership included a hand-painted ball gown, hand-painted full-length skirt, and custom two-piece skirt with a matching leather bustier featuring piping in a print painted by Zapata, all of which were auctioned off by Paddle8 with 100% of proceeds benefiting the CFDA.